Shocking footage filmed outside a federal prison in Brooklyn, New York, shows inmates apparently banging on the walls and windows of their cells to draw attention to their freezing conditions. The Metropolitan Detention Center, which holds pre-trial detainees, has been without any heat or hot water since January 21, and a small electrical fire on January 27 means inmates and workers are now without any lighting. No lights? No heat? No hot water? No meds? Right now EVERYONE inside the building is at risk. Legal and family visits have been cancelled until further notice, and inmates are on lockdown for their own safety and that of staff. Yes, it is also important to remember these are pre-trial detainees, convicted of nothing (not that anyone should have to suffer these conditions). They have a right to see family and their lawyers daily. That has been impossible since the loss of power. It’s a #Schande. 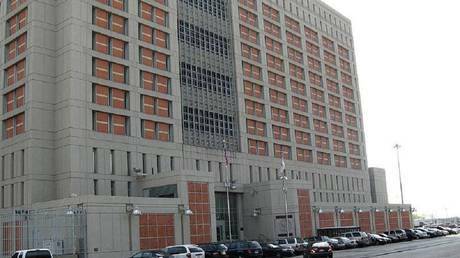 Temperatures below freezing in New York this week prompted inmates to call federal defender offices about the appalling conditions. What can we do to help?? This is absurd and very sad and disturbing. New York City councilman Justin Brannan posted the footage on Friday as he stood outside the center which houses more than 1,600 people. Brannan called the “surreal” moment “one of the most harrowing sounds I’ve ever known,” as the cold men inside pleaded for help. “Inmates are banging on S-O-S on windows to get our attention,” he tweeted. I have a loved one in there and it is true they have no heat in there! they have to do something about this!!!!! Inhumane treatment of human lives. Imagine if you had a loved one in there and felt helpless. The footage has been viewed almost 14,000 times, with about 50 comments asking why the story has not received more media attention. Others questioned how the men could be forced to live in the “outrageous and barbaric” conditions, with some calling it “inhumane” and “tantamount to torture”. After visiting MDC it appears there is some restored heat, hot water & hot meals being served. Still not at full capacity. Still cold & dark. As we weren’t allowed to speak with inmates, unclear if blankets are being distributed. Continuing to monitor this closely.